While the appearance of the red Xbox 360 on Xbox Live doesn't confirm the machine's existence - we took care of that a while ago - it does end the wait for official pics. As you'd expect, the machine's colour matches that of the existing red Xbox 360 controllers. 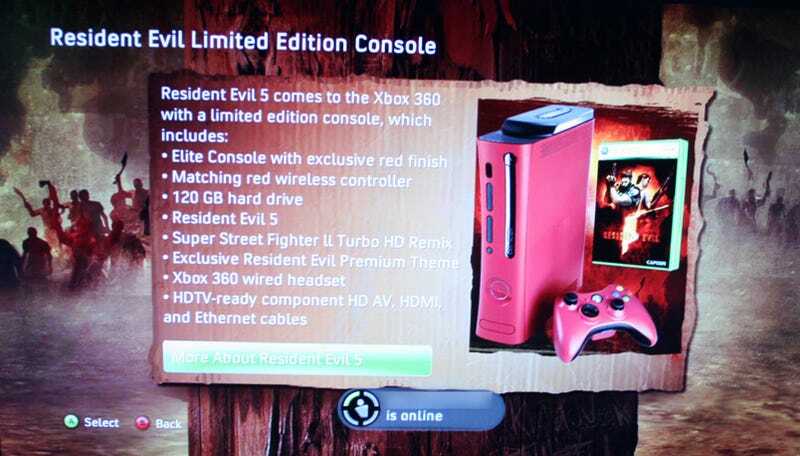 As for what else comes in the box, earlier rumours seem right on the money, with the console bundle including a 120GB hard drive, a red controller, copy of Resident Evil 5, copy of Super Street Fighter II HD, Resident Evil 5 theme and a wired headset. To check it out yourself, just boot up your 360 and head for the "Spotlight" section.